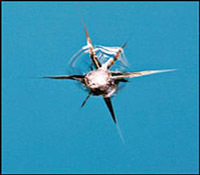 Road debris often strikes a windshield and creates damage in the glass. Unless the cracking process is stopped, it will continue until the cracks or breaks expand to cover large areas of the windshield. These damages range from small "nicks" to large shattered areas. Most of the smaller damages can be repaired without removing or replacing the windshield thus stopping the cracking process. Windshield repair saves time. A repair takes approximately 25-30 minutes compared to a possible 2-hour time frame for a windshield replacement. a replacement. Most insurance companies will even waive the deductible. Windshield repair is convenient. Once the repair is done, there are no further precautions or steps to take. Windshield repairs do not affect the integrity of the original factory seal since the windshield is never removed.